This coming Saturday, May 10, the living dead will descend upon Nashville to terrorize and amuse the city. And this is your chance to join them. Isn’t it great how the undead keep a schedule? They even have a MySpace page. This will be the second annual Zombie Walk in Nashville, following the inaugural walk in April 2007. For the uninitiated, a zombie walk is an event in which many people dress up as zombies and stalk the streets for hours of undead fun. 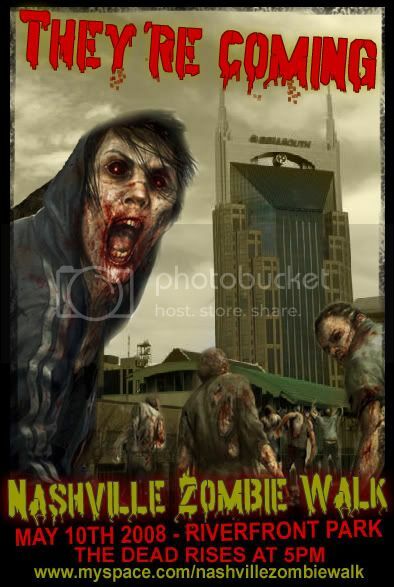 In Nashville, the undead will begin assembling at Riverfront Park (map) on Saturday at 5:00 pm and begin the walk at 6:00. If you would like to join the living dead, conveniently, registration is not required—just show up. Nearly 500 people have joined the Nashville Zombies group on MySpace, but turnout for the walk is difficult to predict without advanced registration. Currently, 23 people have indicated on the Facebook event that they will attend. Naturally, t-shirts to promote and commemorate the event are available to order online. For information and updates, connect with organizers on the MySpace page: http://www.myspace.com/nashvillezombiewalk. It was fun the first 20 minutes. The organizer and her friends had a car parked there, and left the rest of us with a little wave and nothing else. After walking all the way back to downtown, I was pretty disillusioned about the whole "zombie walk" thing. I’m not knocking my fellows from the undead ranks in attendance. Everyone was very friendly, and I did have a great time. I did expect more of the organizer, but hey – it was not a bad way to spend Saturday night. >Be nice to the Police men.